Today's Court Circular records that Duchess Kate held a meeting at St James's Palace yesterday about palliative care for children and young people in her role as patron of The Royal Foundation of The Duke and Duchess of Cambridge and Prince Harry. The foundation is used as as the main vehicle for their philanthropic activities. As patron of East Anglia's Children's Hospices attending meetings like this is part of her role. The Palace has been thinking about how to record the work Kate does behind the scenes for sometime. In the past number of days the Duchess has been visiting potential new charities, however Aides do not want this recorded in the Court Circular because it would reveal which causes the Duchess plans to lend her patronage to. It is clear that Kate is indeed working behind the scenes with her charities and I think it will be more closely documented in the future. We should hear news on Kate's chosen patronages very shortly. 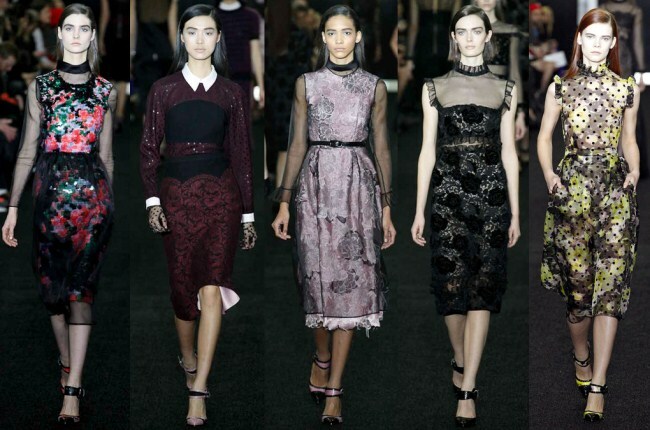 I've been enjoying seeing Kate's designers' Fall 2013 Collections at fashion weeks and today we wrap it up with a look at several of Kate's favourites beginning with Erdem. Matthew Williamson said he was determined to offer his woman a new proposition - and he did just that serving up a collection of relaxed shapes and geometric tailoring. There are a few maternity possibilities for the Duchess in the collection. I have always been surprised by the lack of Burberry in Kate's wardrobe. Aside from the trench coat she wore to Belfast in February 2011 and a shirt during the Canada tour we haven't seen the Duchess in any of their pieces. Will Christopher Bailey's new collection Trench Kisses catch Kate's eye? Unfortunately, the grey print dress is sold out, so let's take a look at a few alternatives. The L.K. Bennett Lizzie Jersey Printed Wrap Dress is a beautiful piece and features three quarter sleeves, tie belt to cinch in the waist and wrap V-neckline. It is currently reduced from £145 to £75 and is available in an array of colours. A printed wrap dress can take one from desk to dinner and is very much a wardrobe staple. Diane Von Furstenberg is the queen of the wrap dress and has a great selection of Repli-Kate's available including the silk jersey New Jeanne Two Dress and the animal dot-print jersey Julian Two Wrap Dress. Charlotte, it infuriates me to see comments on the DM about how Kate is lazy, always looking for a photo op, etc. I wish they knew everything that she is involved in and all of the things that she does behind the scenes. Of course DM will never post anything so nice, so it's up to people like you to show what an amazing person Kate really is. Thank you again for a great post!!! There is no doubt Kate is working behind the scenes working with her charities and selecting new ones. I imagine a great deal of research goes into it and moving forward I think the Palace plan to document her work more carefully. Yes, it will be nice when it is formally documented for all to see. She is such a wonderful role model and such a huge voice for the charities that she is a patron of, and everyone needs to see just how hard she works as a philanthropist. @Christy- I totally agree with you. People just don't believe that it take's alot work behind the scenes when working with charities. I know, I have worked with several. It take's many hours of meetings etc.. But you will always have people that dislike the Duchess and will always say things regarding her work or lack of it in their eyes. It is a no win for the beautiufl Duchess. We the palace and William know how hard she works and that is all that matters. And to Ms. Charlotte- Thank you again for this great post. You are the best. You are so right Pauline. For some, the Duchess can never win, no matter what she does, how she dresses, how she wears her hair, how she smiles, or anything else that makes her so unique. I do think she has more people who appreciate her than not, but sometimes the loudest are the ones who find fault. Dear Charlotte, I had a feeling that you would post something new tonight. I've always believed that Kate was working behind the scenes and it touches me deeply the way she cares for little children. I can't wait to see what new charities she has selected. How nice of them to already send thank you messages to well-wishers! Well, I wish you a very nice weekend Charlotte. Have a nice weekend all of you! Thanks for the lovely post, Charlotte! I've always been amazed by the people who think Kate's job is so easy. It's not simply a matter of shaking a few hands. It takes preparation and education so that one may ask knowledgeable questions about each charity, not to mention being aware of key personnel at each place. I think it must be so challenging for Kate to go into a room full of strangers, knowing the intense scrutiny given to every aspect of her dress, speech, and motivation. Thanks for the link, Monica. :o) Hope everyone has a great weekend! Can you imagine how much behind the scenes work Charles does? He had hundreds of official engagements a year! Then well done Prince Charles !!!!! Glad to see that some of her behind the scenes work is being recorded. It has always been obvious, of course, that there had to be a lot going on that we didn't hear about. Catherine seems to be taking on some of the smaller charities which have to be thoroughly checked to ensure everything is above board. Re the maternity dresses--I had a wrap round one when I was pregnant forty odd years ago. Obviously we should never throw anything away as it is sure to come back into fashion! How nice to see this update. Thank you. Given the criticism Kate has endured (as unwarranted as it may be! ), I think the public should be made aware of every single meeting that Kate and William attend. I believe that is far more important than the Palace controlling what they reveal. Granted, it will never be enough for some of her critics, but it will make their argument appear that much more transparent. I was actually speaking to a royal correspondent this morning who completely echoes your sentiment. He assured me Kate has been working almost daily for some time behind the scenes but until it's documented publicly people will continue to criticise her. William and Kate haven't even been married for two years so I expect meetings with charities provide Kate with beneficial knowledge and experience which she will utilize in years to come and it is quite clear she is passionate about EACH. I think that Catherine and William's support team are showing a lack of expereince here. All other royals post their formal meetings in the Court Circular. The fact that their team haven't has, IMO, caused the Duchess a lot of undeserved criticism. And the wording they have put out - "working out how to inform" - sounds as if they are making it up. I think the couple need better, more senior PR assistance. Pronto! I agree that the meetings behind the scenes should be publicly recorded after they have taken place, at least for the time being. It would help against the criticism. I'm sure the Duchess will be more acive in the coming years, just as Princess Mary is in Denmarck. People seem to forget that it was decided when they married that they wouldn't be working full-time as royals for the moment. I'm sure Kate is very serious about the way she can help the charities and will show it as the years go by. @Annonymous 22:14- Charles has been at this alot longer then the Duchess. The Duchess has only been part of the royal family less then 2 years. You can not count the time they were dating. So let's give the poor girl sometime to get her charities all together. As time goes on she will build her number of charities to be like the rest of the royal family. But there will always be people who don't think she does enough. 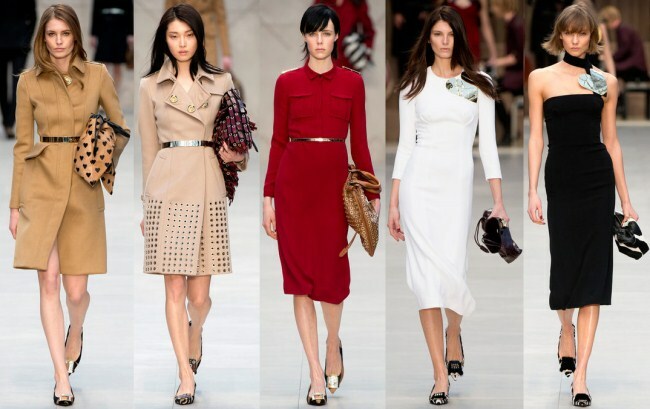 I LOVE the Burberry line and would love to see Kate wear more of it also. I also love the different wrap dresses and think it's a great choice for Kate. It was so kind and affirming what Achille Maramotti had to say. I think the word divine describes Kate perfectly! Kate, I am limited in time this weekend but, I will say if ever I had a daughter I think Kate has been a great role model thus far. I have confidence in William and Kate's role in the future. Enjoy your little ones it goes too fast. Sarah, I love that my little ones are royal watchers like me. :) My mom was always a royalist and I grew up wanting to be just like Princess Di. We were headed to dinner last night and and my son wanted to know if Will and Kate were sleeping snuggled in their bed since it is cold in London. It was 6:20 here, so I told him they probably were. :) They have written letters to them and enjoy hearing stories. I think they are wonderful role models. I just finished reading for the second time "Prince William, The Man Who Will Be King" by Penny Junor, and feel she has an accurate portrayal of the great man he is. I have purchased and read several books on Will and Kate and truly believe they are true, honest, hard-working, compassionate, and loving. In my opinion they are a couple of integrity and are determined to do a great job with what the future lies before them. My boys and my husband are watching English football aka soccer right now and I am wondering what picture will be broken today from them kicking the balls in the house. My oldest really wants to fly to England to see a game. Maybe one day..... I thought a mom of boys would appreciate hearing this. :) Have a great Saturday! Kate, I so miss those days of little ones. Yes., (boys.) the activity level is high.,.... Such precious memories ! The Man Who will be King sounds like a good read. Let me know if you would suggest it when your finished. It is great to see Kate out and about again. I have often wondered why Kate has never worn Victoria Beckham. To be honest I am one of those people who are on the fence about her. I want to believe she cares and that she is working very hard behind the scenes but then the skeptic comes out in me. Why doesn't she show it more? Why isn't she more natural when making appearances? There could be the argument she is worried about putting a foot wrong but then that would mean she is overly concerned with what people think of her and if that's true then she wouldn't do half the things she does and she'd show up for more events and go on less holidays. Her fans are certainly a loyal bunch which is endearing to think people still can be and that they can have faith that she truly is working hard behind the scenes. But then there is the inconsistency of how they defend her. Such as the last article where people were saying how Kate wasn't working that much because she just wanted to be a housewife, but then an article appears saying she held a single meeting and people jump into the "yes! I knew it we told you she works hard! "...which just seems... inconsistent as to what people believe she wants and does. It seems you just have to have faith she cares because she is so.. (Pardon the term I know it's been troublesome lately)..manufactured to be perfect. Melli, I'm guessing Kate's forever being told what to do, how to look, what to say, etc. If I were in her position I would wait until I knew my job thoroughly, knew the rules off by heart, knew all the reasons behind the protocol and so forth, knew my skills and abilities within my job, knew how to deal with people, and was confident in my mastery of all this - and then I'd break out a bit, show more of my personality. And in Kate's job, I dare say that would take a few years. Yes, I agree about the anomalies you see; yes, I am guilty of them and know it myself. How do I explain it? Well, for a start, I just don't believe that Kate is as lazy as some people would have her. I know that Kate does her own cooking, and tends to her potatoes etc., so that tells me she puts some effort into her homemaking. I also guess that there is far more going on behind the scenes; watching royal documentaries convinces me of that. So to my mind, if Kate isn't doing much publicly, I think that's what she's probably doing, cooking a roast for dinner, fertilizing her potatoes, cleaning (I know she has a cleaner, but the cleaner only comes once a week and surely Kate wouldn't let the dishes and washing build up in the meantime), writing letters to children and charities, memorizing the names of people she is supposed to meet, arranging meetings and gathering information that she'll need for those meetings, researching possible patronages, their backstories, their purposes, the people who run them, the work they do, as well as refreshing her knowledge of the protocol she'll have to abide by, and yes, planning and searching for an appropriate outfit for the public appearance while bearing in mind the occasion and venue. We know she puts thought into her clothes, you only have to think of the orchid Jenny Packham in Singapore or the hibiscus Alexander McQueen in Malaysia. I only wish she'd consider windy conditions more, but do I expect her to make a few mistakes, forget something, phrase a question so that it sounds silly? Yeah, of course, contrary to what some people believe, I doubt she's perfect. Anyway, that's my opinion. And I don't think Kate's forever taking holidays either; apart from her morning sickness she's only taken what, three holidays last year? That's what I was told, and I was also told that they weren't longer than a week each. Correct me if I'm wrong. Sarah, I agree with you. That was well thought out. I would also start out carefully. @Melli- By reading your post I think it does not matter what the Duchess does, it would not be enough for you. And that is ok because we are all entitled to our opinions. But I to ask "have you ever worked a charity? If not then I would not question her work. I have worked with charities and there is alot of behind the scene work that goes along with it. Just because it is not in the papers for all of us to read, does not mean she is not working. And then you said you would like her to be more natural. I have a hard tiem understanding what you mean. This beautiful woman is more natural then another royal excpet maybe the queen. I don't believe that she is worried about putting a foot wrong either. If you have the media in your face everytime you go out on personal errands what is she supposed to do? In my opinion she is the best thing that has happened to the royal family in a long time. She brings a breath of fresh air to the family. So I wish you would just give her some time to show you want she can do. And she has done a wonderful job as a royal since she has been married to William. How does Catherine not walk naturally, (or "natural" as you put it)? Someone the other day--perhaps you, stated she walked "like a choir"--I did not understand that either. For some people she will never do anything right---if she wears something only once--she's wasteful; but if she repeats something she is insulting the people who have come to see her. In the past every Royal lady --yes including Her Majesty and Princess Ann has had her turn at being villified by the media. She walks with her hands together in front of her with her left hand and ring showing. This is not how she walks in private as shown by photos therefor it is a manufactured and taught walk. I was hoping for some nice feedback but apparently doing anything but praising the duchess makes me feel like Rottweilers are at my throat. I was not being unkind I simply was saying what was on my mind. I'll make sure to keep it to myself in the future as its not welcome. Melli., I think Kate will walk more comfortly in front of millions of eyes as time goes on. Must be a tricky adjustment unlike William who has years of experience. Ahhhh yes some will criticize, some enjoy, and some on the fence. Have a wonderful weekend Charlotte and all Duchess Kate fans ! @Sarah I totally agree with you. Our Duchess will show them all in time. She is still a newbe at this. Sarah, I love your little song! Wondering if you have seen the finale to Downton Abbey? Hope you have a wonderful and warm weekend! Enjoyed your post as always! :-) With regards to Burberry and I know it wasn't a prominent item or outfit, but wasn't the shirt/blouse Kate wore in the canoe (when her and W were rowed over to the island in the lake to watch the sunset) on the Canada tour ID'd as Burberry? Now that her job behind the scenes is being registred publicly, maybe you will be able to leave the fence behind and decide if the Duchess is worthy or not! Your comment is not the first I have read stating that Catherine does not act or walk naturally during public engagements. To me, she always seems natural and genuine! And besides, even if I am wrong about her naturality, I guess when she is working, visiting her charities she is Catherine, Duchess of Cambridge, not "Kate Middleton". I am not sure if we will be able to see her true self again, like we did during the Engagement Interview! After all, I think she deserves the right to have something private! Hi Charlotte! On a different note, I completely echo your sentiment that Kate should wear more Burberry - however, I was wondering if the trench was the only piece we've seen her wear? I thought the olive green camp shirt she wore on the Canada tour and to the primary school camping trip was Burberry as well. Sarah and Juzz - Thank you so much for pointing that out. I had *completely* forgotten about the shirt! As for Burberry, their trademarks are trench coats and tartan and their evening wear is divine. I have no doubt Christopher Bailey could come up with some outstanding garments for Kate. Perhaps this year? Maybe the detractors can answer this...but how can a man who works full time flying helicopters and saving his countryman be lazy. Of course during the past year he was on royal duty for the Jubilee, the Olympics and for overseas royal jubilee tour. He also attended events for his charities. On weekends off he enjoyed his time off going hunting etc. How is he lazy? While I don't appreciate your tone I will attempt to answer your question although I fear I am only taking the bait. William is away from the base a lot. When he is- someone else is working. So when he does step up for royal duties, royal holidays, and trips overseas- his camarades are covering for him. Then as we heard at the end of the year he was having trouble getting all his requisite flying time. I think he is able to manage it all really well. I also don't think he is lazy. I do however think that as long as he is straddling the fence between his private and public jobs- other people are working double time on both sides for him to have it all. The privileges afforded to him because of his position have made him appear entitled and completely unaware of the domino effect of his decisions. The queen is aging and his country yearns for more of him and his wife. Time to hang up the hat and do what he was born to do with his unbroken attention. @Anonymous 04:19 I totally agree with you. When William is on duty which is a 24 hr. shift, he usually does that for a few days straight. Then he has off several days. He doe snot get special treatment regarding his flying time. Yes he does alot for the Queen but that is his other job. But I am sure that the men who fill in for him has their time off. You can not as a pilot fly mor then a few 24 horus shift's, it is a regulation. @Anonymous 13:28 I don't understand why you are coming off on Anonymous 04:19. She did not say anything bad about William. It is true what she said. He does his shifts like any other pilot but there are times when he need's to be doing his royal duties too. He does not make his decisions. It is his duty to represent the Queen and his country. Both he & his Duchess do a great job. I am sure that when he si away from base the guys that pick up for him get the needed time off as required. YOu can not fly more then a few 24 hours shifts. And William is only the second in line, He father does care out alot of engagemtns but that is all he does. Nobody ever came down on Charles when he was servicing in the Navy so I don't understand why they are coming down on William. Thanks for your fair assessment. Rather than being lazy he is trying to serve two masters, The Queen and the military and when you do that sometimes both suffer. He is not lazy, he has too much on the plate and is all too human. As the sister of hospital scheduler, it is very unlikely that when William is away on engagements that it causes the kind of job chaos imagined by above posters. It might be different in the UK (doubt it) but in ALL 24 hour jobs there are systems in place for ALL workers who need time off. In William's case, he needs time off for engagements in London. In the case of other workers, they need time off for medical leave, vacations, family emergencies, death in family, etc. - but these are all leaves that need to have shifts covered. These shifts (that need to be covered) are picked up by workers from the spare board. On the spare board are workers who are not routinely scheduled for work. When William - or any other worker is away from the job - a worker near the top of the spare board would be offered those shifts. Usually those at the top of the spare board (likely those that have seniority) work almost full-time. Those near the bottom of the spare board work less (how much less depends on the size of the spare board). In Anglesey and in your community - all jobs that have to be staffed 24 hours - like rescue workers, firemen, police officers, hospital nurses, etc. - almost every worker starts out on a spare board type of system. The idea that when William is in London, his shifts have to be covered off by a regular co-worker are ludicrous. I think it's good that Kate background activities are being recorded. She needs to toot her own horn and have it on record. Of course her detractors who hate everything she does will say oh she is arrogant or an attention seeker but that will happen regardless. She needs to have things on record. The beautiful Duchess will never please everyone. The one's that dislike her will always dislike her no matter how much she works. And the ones that love her will always love her again no matter what work/no work she does. Oh Charlotte, one more thing. I have noticed in this post and the last that the hems on dresses are going back down. It seems like it has been a long stint for the short ones. I'm so glad about that. At my ancient age, I cant wear the short ones. They are cute on you younger ladies though. I agree, midi length dresses are very popular and look great! Hi Charlotte, thought this was a nice alternative to Kates grey wrap dress http://www.boutique1.com/new-jeanne-two-dress-207856 :) comments on iphone arent working again so I've had to use my laptop :( was going to post link to you on twitter but thought blog readers would benefit from link on here :) hope you are all well. I don't often weigh in but I will put my 2cents in on this one. I see Catherine as a lovely young woman we have chosen to put on a pedestal and she has accepted to fulfill this role to the best of her ability. We will comment on her clothes, hair, jewelery and lifestyle and she will do her best to live up to our expectations. In the end though we do not really know her and will always interpret her actions through our own eyes and sometimes forget that she has her own. She will sometimes not live up to our expectations and we will sometimes forget that she is not perfect and respond in a way that does not speak well of us. I will continue to watch her as a form as escape from my own life even though as a whole my life is wonderful. I will try not to have my expectations exceed what I would want others to expect of me and I will give her the same benefit of the doubt as I give to everyone else until proven otherwise. Very interesting to read that the Palace PR machine is trying to find a way to record the work Kate supposedly does "behind the scenes." I suspect that the pressure for Kate and William to step up and do more is increasing, not only from the public but also from within the Palace and the royal family itself. There was talk before their marriage that, as senior royals, they would be expected to take on more public roles after their marriage, honeymoon and settling-in period was over. One only needs look at the schedule of public engagements for the Queen and Prince Philip, then for the Princess Royal and other members of the royal family (who aren't nearly as close to the throne as William, Kate and Harry are) to see a glaring gap between what they do and what William and Kate do. That's not criticism, it's fact and the fact that the Palace is trying to find a way to publicize the non-public time Kate spends working shows that others have noticed that gap. It does get to be a little disturbing that so many people on here see William and Kate as some sort of divine beings, perfect, blemishless and above any kind of criticism. I can't help but think that was how Diana was regarded - and it kept her adoring fans from seeing that she was, indeed, human and had some very real problems and it also put an enormous pressure and stress on Diana to be that perfect, divine being, to hide any problems or issues and live up to fans' expectations. @Elizabeth- So you are saying that William is not pulling his weight as a senior royal? Well did you forget that he has a full time job as a RAF Pilot? And does engaements for the Queen? Maybe not as much as you think he should be doing. So what will you think of William when he decides to stay in the military. And here in the UK most everyone does not make a big deal out of the number of engagements that William and Catherine do right now. It seems to me that all the fuss is from people from other countries including the US. Since I live in the UK the way I think about William & Catherine is if what they do is ok with the queen then really nobody should worry. And as far as I know the Queen is very happy with how William & Catherine are doing with their engagements. And since Catherine has been sick with her pregnancy and now feeling better, we will see more of her. But people you need to give the girl a break. I truely loved Diana and never once did I think she was divine, far from it but, she had a good heart as I feel Kate does. No perfect! Not! My over enjoyment of this blog is, those who want to support a young lady through thick and thin, the shear frivolity of fashion and some good chats with the ladies (for the most part) Obviously if she was to cross certain moral lines, I would bail on my support. At this point she has been a great role model. Except to those who want her to work more. The Palace as you say (which includes a lot of people) make mistakes and hopefully learn from them. I am honestly curious to find out how many people are not happy with W & K.
I have to confess one of my sources is the daily mail (although I'm probably ashamed to share with anyone from *the real world* LOL! other than my husband. Their headlines and some of the trashy news are behind that). So I wouldn't consider their comments to be fully representative of the population, yet even on other magazines and newspapers the comments are soo negative. I understand that people take advantage of the internet's anonymity to express themselves more harshly. So I wonder. The only British reference I have is my husband's coworker (and he lived in Spain for years before moving to the US); his opinion is basically that as much as the royals are disliked they should keep them bc they keep things English. That somehow otherwise, it would just be a big melting pop similar to the US. My husband and I were planning to visit the UK in the fall, and now a friend's wedding (in Mexico!! #dislike) is putting that at risk :p so I'm not happy that it could easily mean another year without me getting the actual "feel" in person... but I am extremely happy that my friend is getting married :) (although I'm still crossing my fingers for a Spring 2014 wedding instead). Back to Elizabeth's comments: I might be *paranoid* with you, but I do believe the PR machine is out at work. I understand that work behind the scene takes place, but then again there is TEAM as well. Regarding the disturbing fans (LOL) I just hope nobody bites my head off when I ask questions. Actually I found all you have had to say quite refreshing. Yes we in America are more and more a melting pot. (Really the British were much more open to different nationalities) before us. even though my husband was out of work for 1 year because of the latest economical problems. Hello all. Just wanted to comment that Catherine seems shy to me, looking at her body language. Or at least not super confident (hands clasped awkwardly, touching hair a lot.). I am not an expert though. If you watch any videos of her appearances, there are so many photographers, all shouting. Then when she is with whichever charity she is meeting with, all eyes are on her. If she doesn't feel particularly well informed, this is probably nerve wracking and exhausting. She seems to be growing in confidence, and into the role. If you aren't a natural extrovert, her job is not easy. I think she is committed to it, and no one should cast judgement. Isn't the Queen enough of a judge for her? Intimidating!! I also think that because her marriage is a love match, she is ultimately responsible for being a supportive wife, to someone who will have to eventually take on the responsibility of monarch. Her value to her country is not just in what she can do, but what she can do to help her husband be a true leader. I think he needs the help!!! By the way, (all Duchess Kate Fans) you are all invited over for dinner! I'm making 3 lbs of spagetti, sour dough garlic bread, salad and homemade carrot cake n icecream. It's my moms 76 th B-day but I don't think she would mind the extra company! Wish your Mum a very happy birthday. @Sarah- Thanks for the invite. Wish I could be there in person but I will be there in spirit. Wishing your mom a very Happy 76 Birthday. This blog is nice. And I frequently read it because the duchess is fun and fascinating. And the fans, like me, are enjoying her public appearances and tidbits of her activities. It's just hilarious that some commenters are very negative- complaining about the duchess' this and that- without really thinking about what it's all about. Other commenters have such ridiculous expectations of her. The rest of us don't really know what's the duchess' work is about. Other commenters treat her like a showbiz puppet- for everyone's amusement. She's a Duchess. Of course she can't hold a regular job. She needs to do duchess work. And some think they're PR experts and all, royalty charity work experts and all, making a fool of themselves offering unsolicited advice on what the duchess needs to do. Well, anonymous, I believe that there are some people who work in PR who do comment here so they might actually BE experts. So people who criticise the duchess make fools of themselves? What about people who adore her blindly and refuse to accept any kind of "negative", even when it's fact? Kate had a barrage of bad publicity because of the vacation, and because her HG appears to have cleared up very very rapidly. SO, what happens? Photos are taken on the beach and shopped, then comments Hilary Mantel made TWO WEEKS PRIOR are trotted out to get the public all worked up about poor Kate and all she has to deal with. Then on a freezing day she goes out and about with no coat so the world could see the Gestating Heir. Then last but not least, we hear about how she chaired a meeting "behind closed doors" so we can see how hard she really does work. You don't think any of that is PR? I sure do. Bluhare, these are the facts in your 3rd paragraph: Kate went on vacation; Kate had HG; photos of Kate on the beach were taken; Hilary Mantel made comments about Kate; Kate didn't wear a coat to an engagement; Kate chaired a meeting. The rest is your opinion of these facts. MariBy: Yes. Take HG, put it first, Hilary Mantel and put her second (as to when she actually made the comments) and then the reporting after they got back from vacation and you've got some facts in a time line. Isn't that what I said? And the rest is indeed my opinion of those facts. What is wrong with that? This is a blog where people post their opinions. None of us (unless one of you is Kate socking herself) knows what Kate does or thinks. We just put our own spin on it, and the world goes around. I too love the longer length. I just find it so relaxing when you are not concerned about pulling your dress down or can sit more comfortably. Also, if you are able to maintain a "set" size, it is nice when you don't have to dismiss a certain dress because your current status/job/age no longer allows for a short hemline. I love Dr. Biden, but can't stand that at her age she shows too much leg (knee) and arms. I don't care how good looking or fit she is, sorry. She's got a boot addiction too!! Not that there's anything wrong with that. One note for Repli-Kates and one question. The note is that the US retailer Kohl's (www.kohls.com) is offering a nearly-identical faux-wrap dress in its Apt. 9 brand to the grey print MaxMara piece Catherine wore. The question ... I am trying to find a button pendant similar to the Asprey one Catherine is often seen wearing. I can't afford the Asprey edition, has anyone found anything similar? Thanks! Love the blog!